In order to add fancy frame beauty to my cookie platters I've come up with two general ways to approach cutting a fancy plaque from other cookie cutters I have on hand. 1. 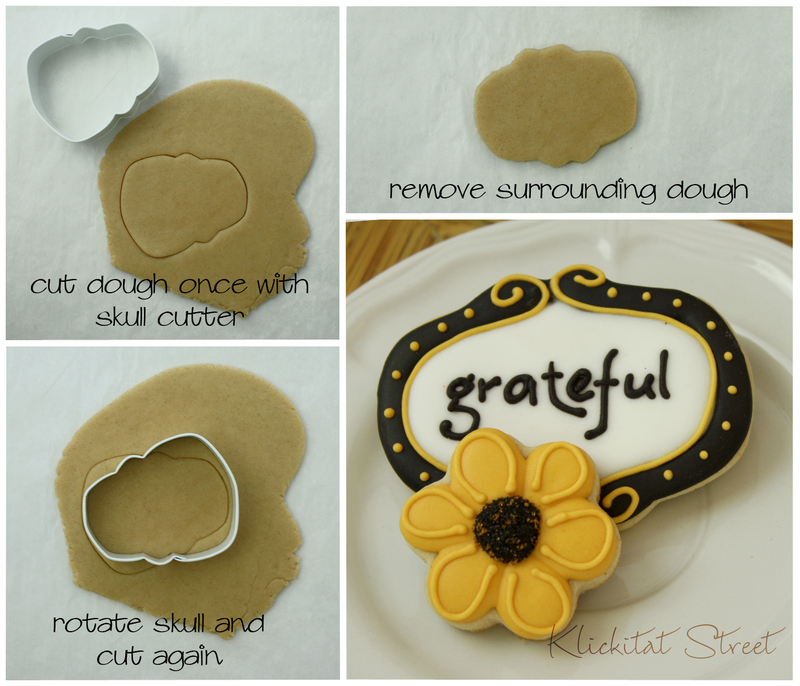 Rotate the Cutter and Cut Again- The basic idea of this approach is simply that you cut the shape from the cookie dough and then rotate the cutter to create an interesting shape in the overlap and cut again. 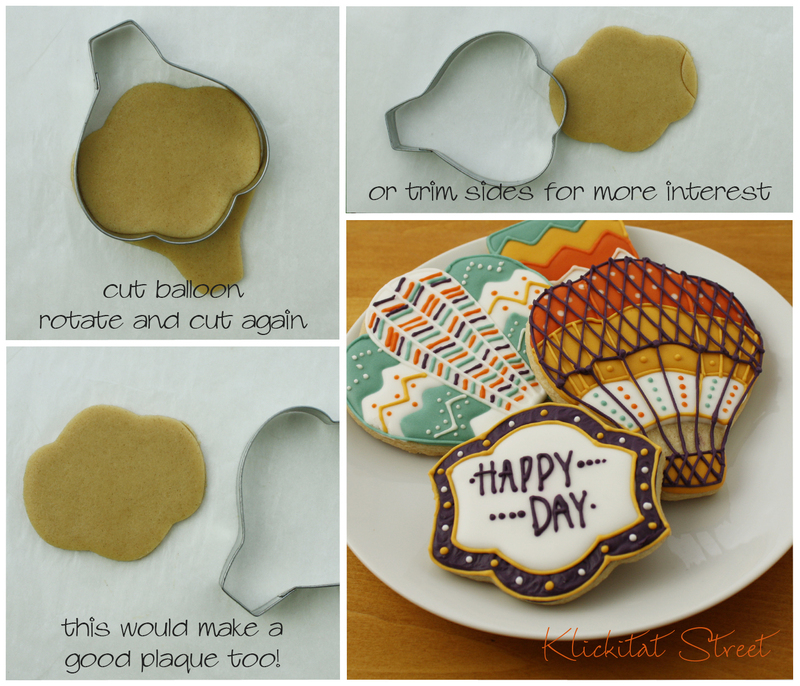 I made these hot air balloon cookies for my Mom's birthday recently and I used the balloon cutter to also cut a couple of plaques. 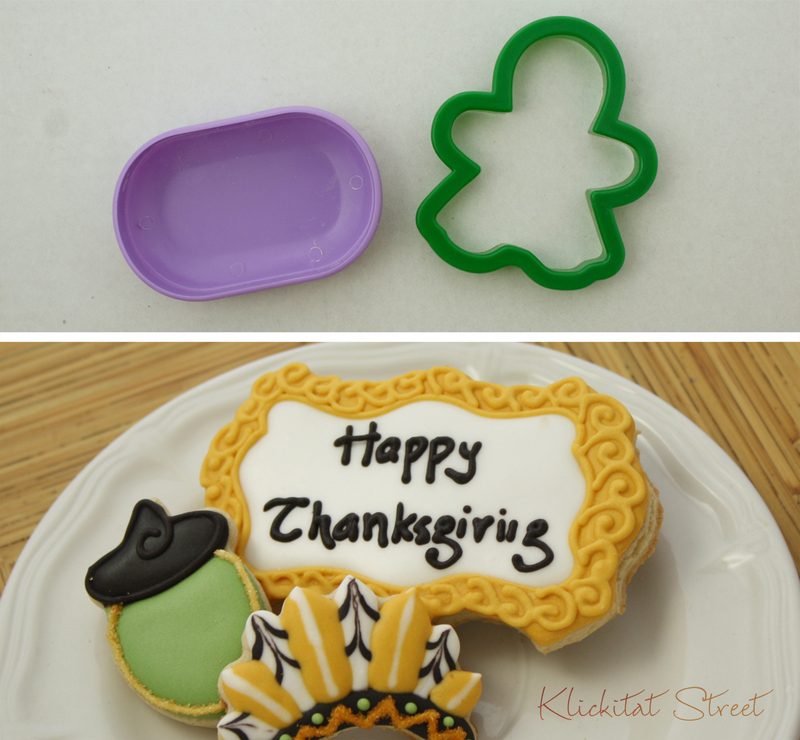 Even if I did own all the beautiful copper plaque cutters in the world I would still cut plaque cookies this way because I like how it repeats design elements I've already used in the rest of the platter! I love the simplicity of the this plaque made from rotating a skull cutter. It's basically just an oval but with a little flair. I used the skull cutter for this plaque too but i also cut the sides with a small point of something for more interest. Rotating and cutting like this tends to give a plaque on the small side (but not quite a mini plaque) and they are perfect for just one word! the cutter must be symetrical side to side so that the cut is the same when you rotate the cutter. the resulting plaque will be on the small side because the final piece is well inside the original cutter. 2. Trim a basic shape - This idea to this approach is to cut a basic shape like a circle or square and then trim it out with part of another cutter. These plaque cookies are from a recent set I made of Coca-Cola polar bear cookies. 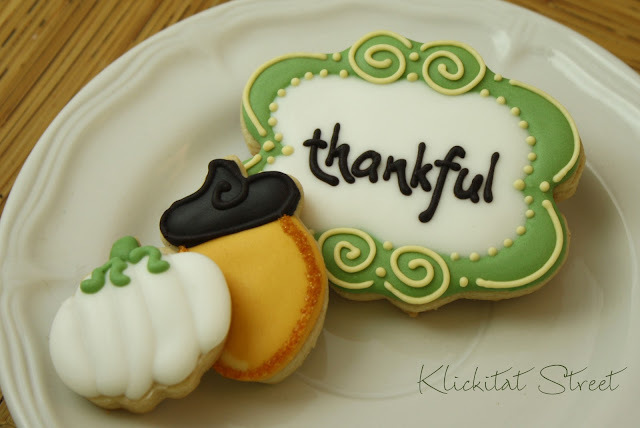 Again, I chose a shape from the other cookies I was making and used the ears of the bear to trim the plaque cookie. The purple "cutter" here isn't actually a cookie cutter at all. It's a random lid from I don't know what but it has a perimeter edge so that makes it a cookie cutter in my world. I wasn't lying when I said there was nothing fancy about these cutters! I used the purple lid here again and cut on all four sides with a gingerbread girl cutter to give the plaque a large scalloped edge. I trimmed a hexagon just a tiny bit with a butterfly cutter for this one. This plaque is pretty big and you could write a poem on it if you wanted. You have a lot more control over the size of the final cookie with this method. The final plaque will be much closer to the original cutter because you are only cutting a little here and there. It's easy to cut large plaques or minis and everything in between. Only one edge of the trimming cutter is important so don't worry about what the rest of it is doing. 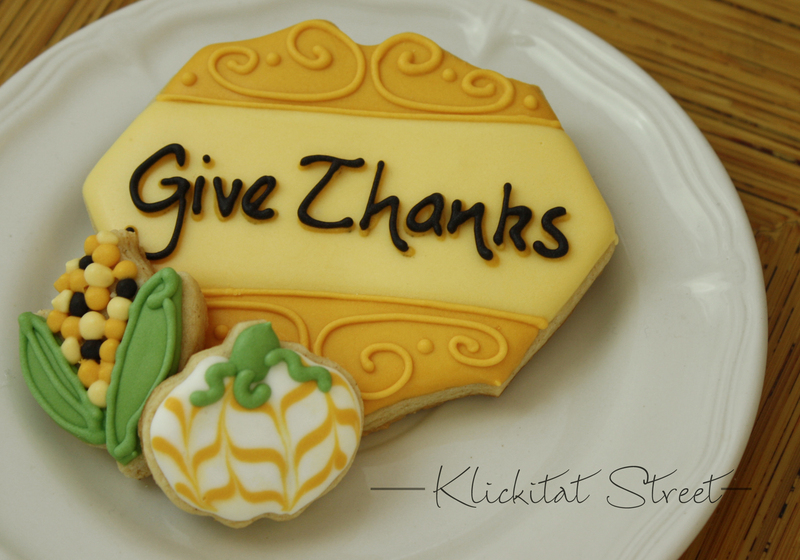 Look for cutters that have detailed edges that aren't too deep like bumpy pumpkins, car wheels, animal heads and feet. The cutting edge of the trimming cutter has to be symmetrical but the entire cutter does not. For example, the wheels of a train cutter are symmetrical to each other even though the train cutter is not symmetrical overall. When I make plaque cookies I'm usually only adding a couple to an entire set so I don't worry about reproducing the same shape again and again. Of course, it can be tricky to line up all those cuts back in the same place every time. 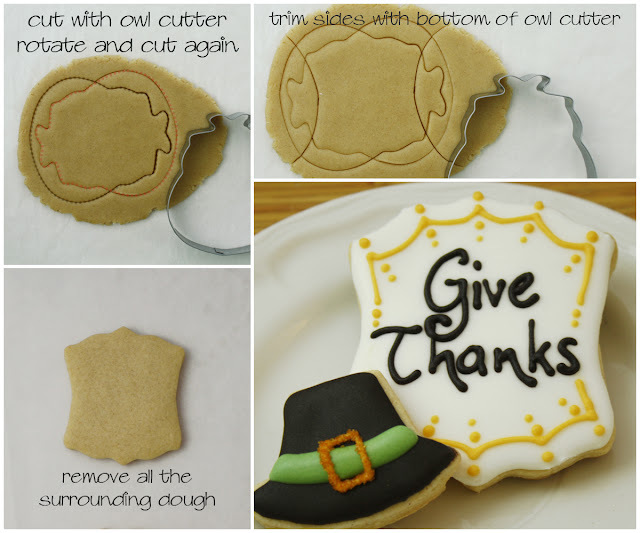 If you create a shape you really like or if you are in a bind and can't get a fancy plaque delivered in time to make dozens of cookies then I suggest making a template out of plastic by tracing and rotating the cutter in the same way you would if you were cutting. Cut out your template with scissors and you can place it on the dough and use it as a guide for your cutter so all the plaque cookies will be the same. 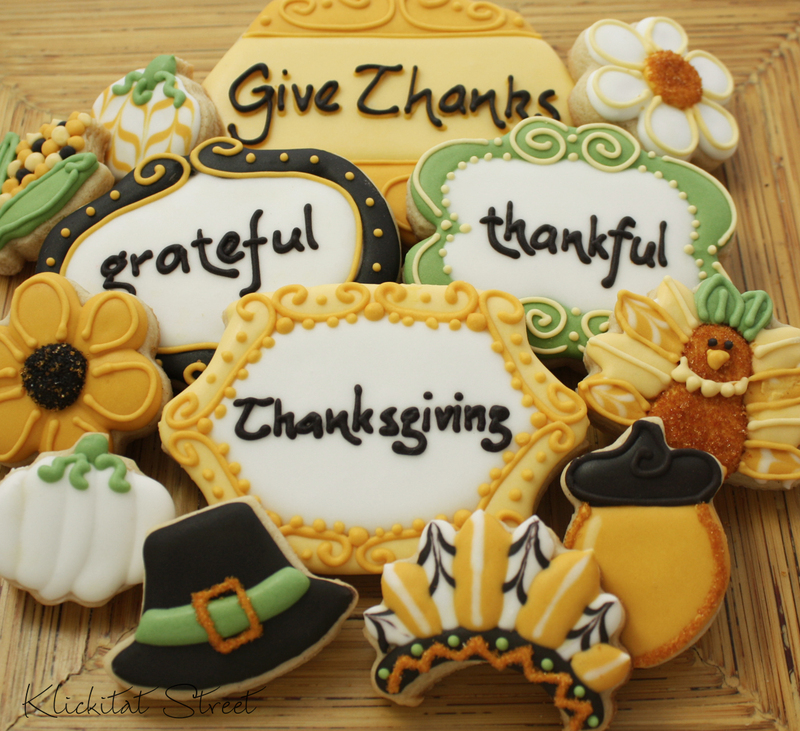 If you make plaque cookies this way I'd love to see them! You can leave a link here in the comments section or post them to my Facebook wall. Fantastic tip! I just love your creativity. Wow!! This post is just packed full of ideas!! Thanks so much, you really got my wheels turning. Be back soon with a link for you, using this great tip! One of the most helpful tips I've come across in a long time. LOVE. I'm always amazed with your ideas!!! 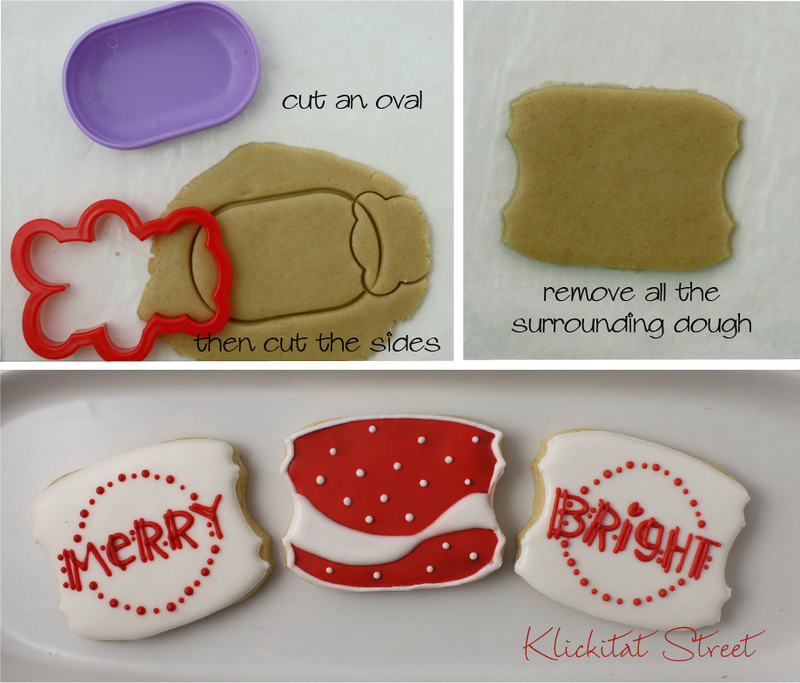 You make me wanna take all my cookie cutters out and start trying new ways of using them!!! Loved this post!!! Thank you!! Awesome ideas!! !Thank you so much!!! What do you mean *not so fancy* These are beautiful, the entire collection is wonderful and you are so smart to have created them. These are so fun! Great ideas! I just recently discovered your blog and you are AMAZING!